Two years ago, Church of God Ministries celebrated through a CHOGnews article the remarkable kingdom contributions of a blind minister to scholarly Bible study. Already awarded by the National Federation of the Blind, Sarah LaRose never set out to be recognized. This AU School of Theology and Christian Ministry professor had contributed to the improvement of tools commonly used by visually impaired persons to read documents, including the Bible. In the past two years, her love for ancient languages and her love for the Word of God have inspired her to continue doing as much as possible to remove barriers for the blind. One of her most recent accomplishments was translating the two-thousand-page Brown-Driver-Briggs Hebrew-English dictionary into braille, resulting in eighty braille volumes. This semester, Sarah is thrilled to teach Greek alongside longtime professor Fred Shively. The course is online, and while he’s taught the subject matter countless times before, his online teaching experience was lacking. Sarah, who has taught as an adjunct professor and has much online experience, complements the teaching team. 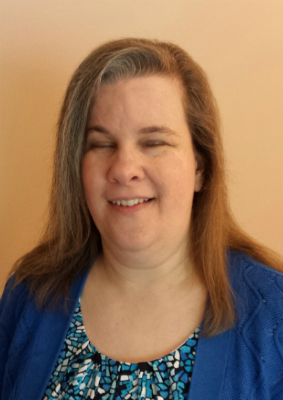 Sarah and her husband Kevin also update a blog about life and ministry as a blind minister and professor. Her Facebook page has garnered a faithful following, of which perhaps a third are also visually impaired. During her major translation projects, she’s kept in touch with manufacturers of translation technology for the blind, offering insight and valuable feedback when necessary. Sarah LaRose was invited to present a paper at the International Conference of the National Association of Professors of Hebrew last year. Her love for learning is perennial, and she contributes to the kingdom and academia as much as possible. Her story is inspiring, and her heart for the Lord is strong. Want to hear more from this incredibly gifted communicator and minister of the gospel? Sarah Blake LaRose, who will complete her doctor of ministry next May, is on the Indiana pulpit supply list! Learn more through Indiana Ministries at www.indianaministries.org. Interested in learning Hebrew or Greek? Learn more about the Anderson University School of Theology and Christian Ministry at www.anderson.edu/sot. This entry was posted in All Church of God and tagged accomplishments, ancient language, Anderson University School of Theology and Christian Ministry, AUSOT, Bible dictionary, Bible study, biblical languages, follow-up, Fred Shively, God's Word, Greek, Hebrew, professor, Sarah Blake LaRose, scholar, SOT. Bookmark the permalink.